Sam Vesty praised Saints' talented young half-back pairing after Alex Mitchell and James Grayson steered their side past Bristol Bears on Saturday afternoon. 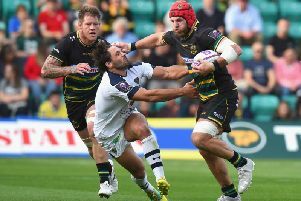 Both players etched their name on the scoresheet while taking a real grip of the game as Saints secured a comfortable 51-24 victory in their Premiership Rugby Cup opener. Francois van Wyk scored twice, with Reece Marshall, George Furbank and Andrew Kellaway also dotting down at Franklin's Gardens. And attack coach Vesty said: "I thought Mitch and Grays managed the first half really well. "They kept putting the pressure back on to Bristol and when our chances came, we were very clinical. "Both our half-backs are really good players. Mitch has had a bit more rugby than Grays, but Grays had a really good pre-season. "They showed what they can do and the challenge for those two will be doing it consistently and doing it under more pressure. "Bristol will be disappointed with how much pressure they applied to us today and you've got to put it into context." All in all, it was an impressive showing from Saints, who, like Bristol, rested a host of first-team regulars. But it was the home side who fired, ensuring the 14 changes made to their matchday squad only spurred them on. "You need to get warm, you need to get ready to play and the boys who needed to step up did," Vesty added. "When you give young players an opportunity, they very rarely let you down. "I thought Alex Moon was excellent - he really gave some go-forward in the forwards - and Ollie Sleightholme looks a really difficult man to tackle. "Furbs (Furbank) had been out for a long time and hadn't played a lot of rugby so it was great to see him back and controlling things as well."